BASTROP – A state district judge in Bastrop on Wednesday heard arguments for and against the contention that four landowners are entitled to a new hearing because they were wrongfully excluded by the Lost Pines Groundwater Conservation District from participating in a 2013 administrative hearing. The 2013 hearing resulted in a permit to water marketer End-Op LP (now known as Recharge Water) that allows massive amounts of groundwater to be pumped and exported from Lee and Bastrop counties. The Oct. 18 hearing was part of a legal challenge to that permit. Judge Carson Campbell ruled in favor of the landowners from the bench Wednesday on the question of whether he even has the authority to review the District’s decision to exclude them. A ruling on the landowners’ right to protest the permit is pending from Judge Campbell. SAWDF response to Bastrop Advertiser’s misleading article on July 21, 2016. The Honorable Carson Campbell of the 21st Judicial District Court of Bastrop County will hold a hearing on End Op, LP’s “request for declaratory judgment on lack of jurisdiction.” (See background below). 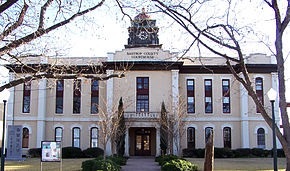 The hearing will be held on Wednesday, March 4, 2015, at the Bastrop County Court House, 804, Pecan Street, Bastrop, TX 78602. The public is invited to attend. Landowner attorneys will argue before the judge for dismissal of the request. That’s a lot of legalese. Basically, End Op is attempting to throw a stick in our spokes and derail our appeal in state court to gain “party status”. This is End Op’s ongoing attempt to deny local landowners their due process rights to oppose End Op’s permit application to export 46,000 ac-ft/yr (almost 15 billion gallons) of groundwater from Bastrop and Lee counties to feed the thirst of the I-35/TX-130 growth corridor. End Op has yet to find customers for that water after years of hustling. Lawyers for Environmental Stewardship and Landowners will make oral arguments before the Lost Pines Groundwater Conservation District Board of Directors on August 13, 7:00 p.m. at the Bastrop Convention Center. ES and Landowners are requesting that the decision by the ALJ to deny party status be reversed and remanded back to SOAH for contested case hearing. The public is encouraged to attend. Though public comments will not be heard, the face of the people needs to be seen. This is a very important hearing about your rights to defend your interests in the groundwater beneath your land. Landowners in Bastrop and Lee counties who were recently denied the right to be heard in a contested case hearing are appealing the decision.